“It’s a complicated title for such a fun, breezy, yet chilling and thrilling novel, but author Hideyuki Kikuchi has a way with words—and it’s best to have the best understanding of his titles for the greatest enjoyment of them. 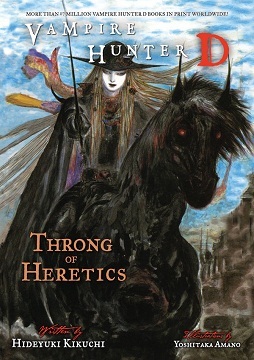 In this twenty-fourth volume of the fan-favorite vampire series, a motley crew of hunters is hired to investigate, and if necessary, eradicate a potential massive uprising of vampires long buried and contained at the edge of the Frontier. Amongst this motley crew stands the half-vampire hunter known only as D, astride his trusty cyborg horse, and as always, accompanied by a running commentary by the demon possessing his left hand.